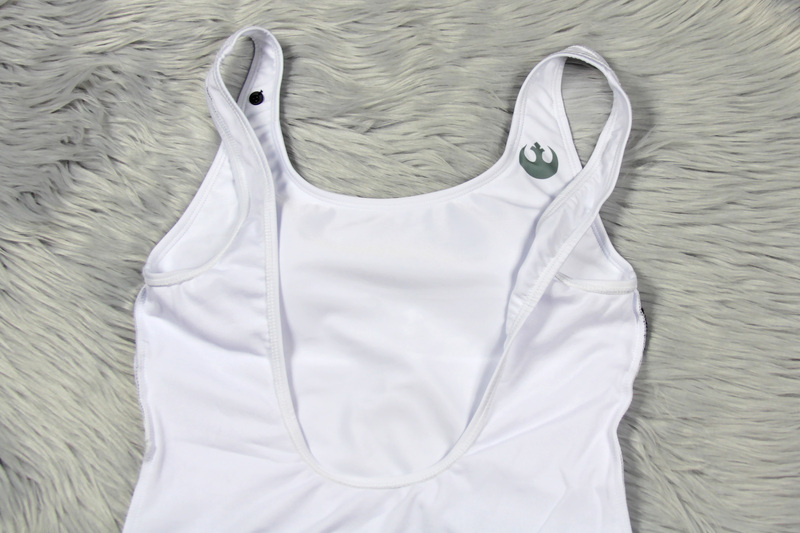 Today’s review features the women’s Musterbrand x Star Wars Princess Leia swimsuit. This swimsuit is part of the women’s Star Wars swimwear range that Musterbrand released earlier this year, and it caught my eye straight away. I am always on the lookout for more Star Wars swimwear for my summers at the beach, and this Leia swimsuit is a perfect mix of Star Wars style and subtle costume inspiration. Available in sizes XS to 2XL, the swimsuit is available direct from Musterband, or from stockists ThinkGeek and Amazon US – Musterbrand and ThinkGeek can ship internationally! 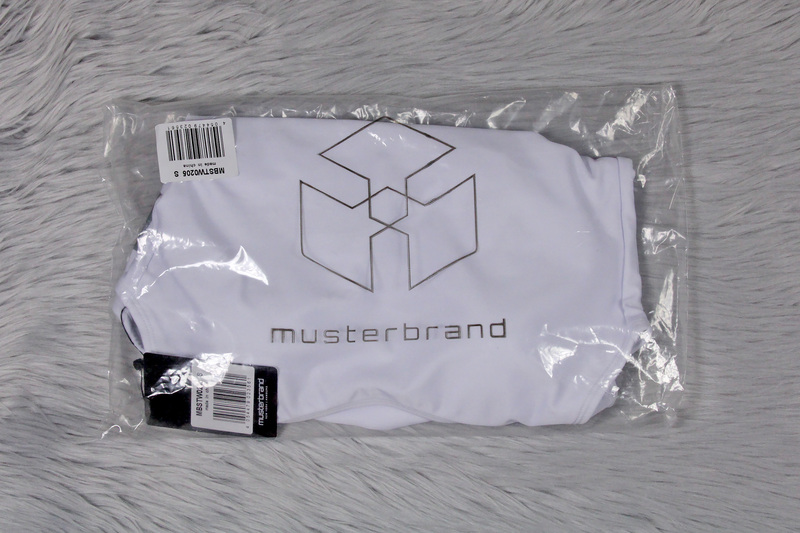 The Princess Leia swimsuit came in a clear plastic packaging bag, with the Musterbrand logo printed on the front. The swimsuit is a classic one-piece design, inspired by Princess Leia’s white outfit from A New Hope. Made from 85% Polyester, 15% Elasthane, the white swimsuit has matching white lining fabric, and removable soft bra cup inserts. 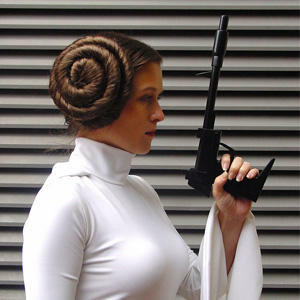 Of course many fans would think of the metal bikini as inspiration for Princess Leia themed swimwear, but I am really happy that Musterbrand chose Leia’s classic white outfit instead. As a big Princess Leia fan, this piece was my favourite from the Musterbrand Star Wars swimwear range – even though it was all white! I’m sure I’m not the only one who usually chooses dark colours for swimwear, in the belief that it’s more ‘slimming’ – even though I keep telling myself that I should be having fun swimming, not worrying about how I look! If Princess Leia can wear all white and look amazing, then so can we! 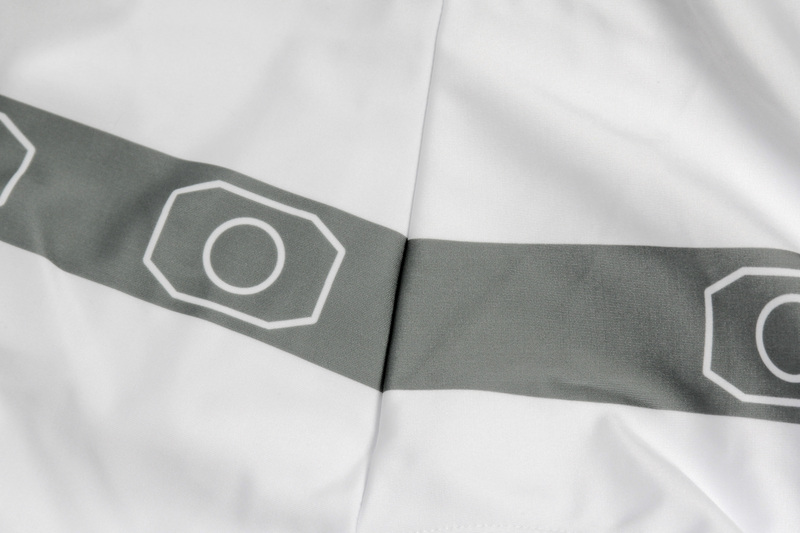 The outer layer of white fabric has a matte finish, with a good thickness. Combined with the lining fabric, the swimsuit feels ‘thicker’ than I expected – though of course anything thinner would risk being a little see-through in areas. As usual, avoiding contact with rough surfaces will help keep your swimsuit looking good. The black cardboard store tag is attached with black cord, which is looped through the inner garment tags – it doesn’t pierce the garment itself, which is great to see. 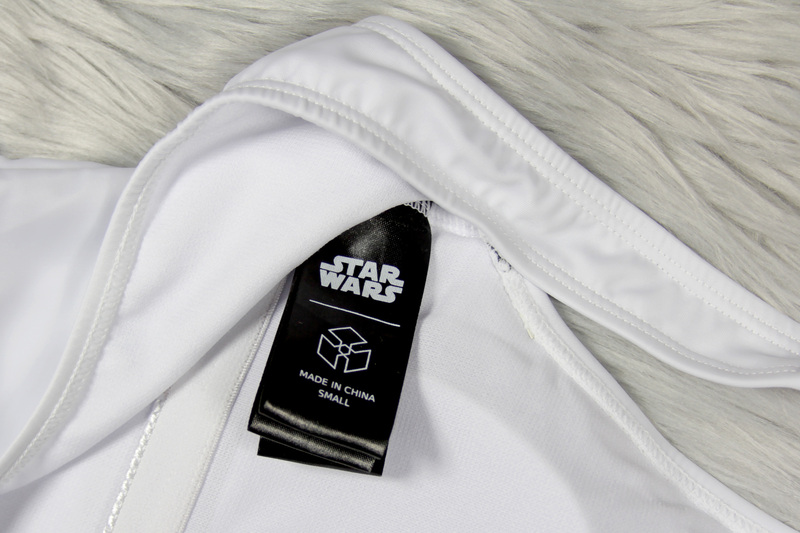 The store tag features the classic Star Wars logo, the Musterbrand logo, and Lucasfilm copyright information on the front, and bar code information on the back. The back of the swimsuit has a scoop-back shape, not a racerback. This shape gives enough space in the back for the belt print, but fits a little less tightly around the chest. Personally I don’t mind which back shape a swimsuit has – racerback shoulder straps stay in place well, but tend to get stretched out faster from pulling the swimsuit neckline over your hips. With the cup inserts, you can wear this swimsuit as a bodysuit without having to wear a bra underneath – which is nice if you like to throw on a skirt or sarong over your swimsuit for an easy outfit at the beach or pool. The main design detail of this swimsuit is of course the ‘belt’ print. This is inspired by Princess Leia’s belt from A New Hope – fans will know that Leia wears a white belt with silver details with her classic ‘senatorial’ dress, and a silver belt with silver details with her Yavin ‘ceremonial’ dress. White-on-white detail doesn’t show up well for a printed design, so for this swimsuit (and many other Princess Leia costume-inspired garments), the belt is depicted in a grey/silver colour instead of white. For this swimsuit (size small), there are 3 ‘plates’ printed on the front belt (including the central pointed ‘plate’), and four ‘plates’ printed on the back section of the belt. This is the same as in the advertising pictures, though I am not sure if the design is different for any of the larger sizes. The belt print measures approximately 4cm tall/wide, expanding out to just under 6cm wide at the front pointed part of the belt. One detail I am always picky about – how well prints match up at the seams. It is just distracting when a print/design overlaps a side seam, and it doesn’t match up. I am so happy to see that the belt print on this swimsuit is lined up perfectly on both sides. It is a small part of the overall design, but this shows an attention to detail during construction that you would expect for a quality garment. The Rebel Alliance ‘starbird’ symbol is printed on the upper left shoulder, just at the start of the shoulder strap. 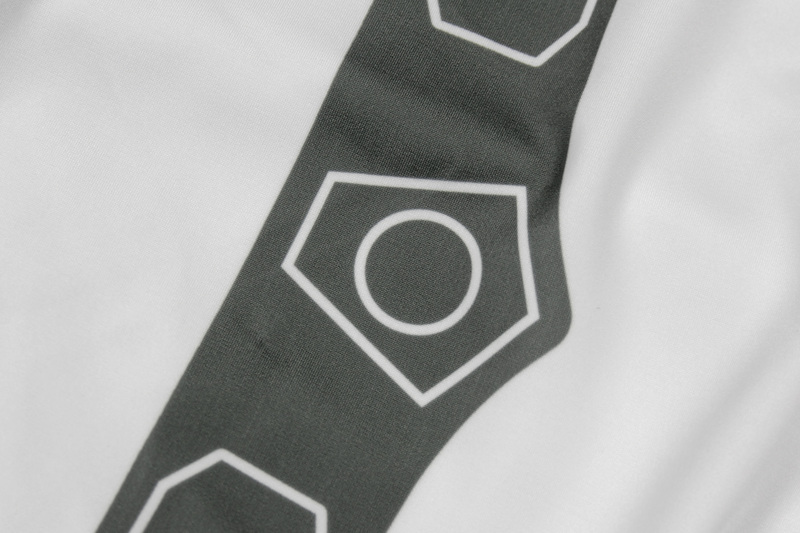 This symbol is printed in the same grey colour as the main belt print, which keeps with the Princess Leia theme nicely. The size and placement works well, adding just the right amount of Star Wars branding to the design without being too distracting. The printed details on this swimsuit are nice and clear, which is especially important against a stark white background. They are the focal point, so it’s great that they can withstand inspection even up close. One of my favourite little details on a Musterbrand item – the small metal Musterbrand logo tag. On this swimsuit, the embossed metal tag is appropriately smaller than the ones used on jackets, and is sewn onto the right shoulder strap. It provides a nice visual balance to the Rebel symbol on the other shoulder. Turning the swimsuit inside out, the entire swimsuit is lined with matching white lining fabric. This fabric has subtle texture to it, and is soft against the skin. Now with a white swimsuit, I was concerned about how see-through the fabric may be, and of course this was taken into consideration. The whole front of the swimsuit has not one, but two layers of lining – so there’s three layers of fabric to hide your bits. The second layer of lining starts at the shoulder straps, and continues down the whole front and finishes at the crotch seam between the legs. The back of the swimsuit has one layer of lining fabric, which is plenty for this area. 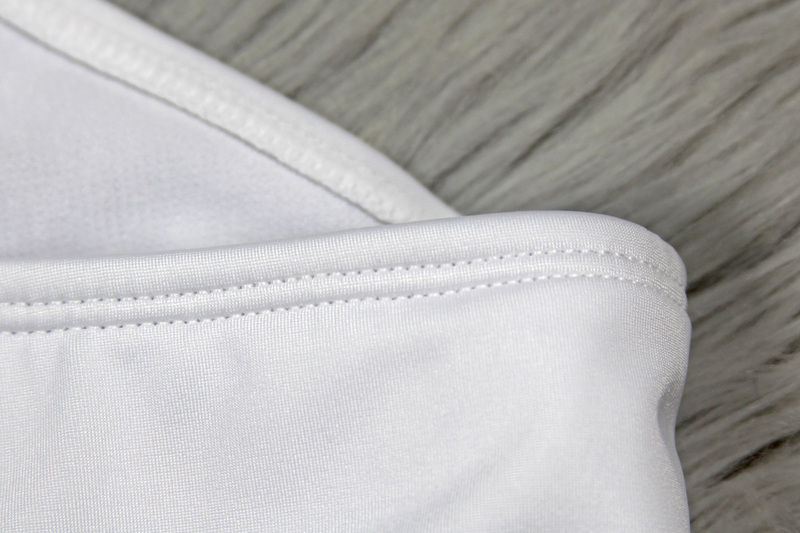 This swimsuit has soft shaped bra cup inserts – a great feature for any swimsuit, but especially appreciated in an all-white design for a little bit of added security. The cup inserts are located between the two front layers of lining fabric – held in place by a seam along the bottom of the chest panel, and a line of stitching between the cups so they don’t go ‘wandering’ and end up both on one side! 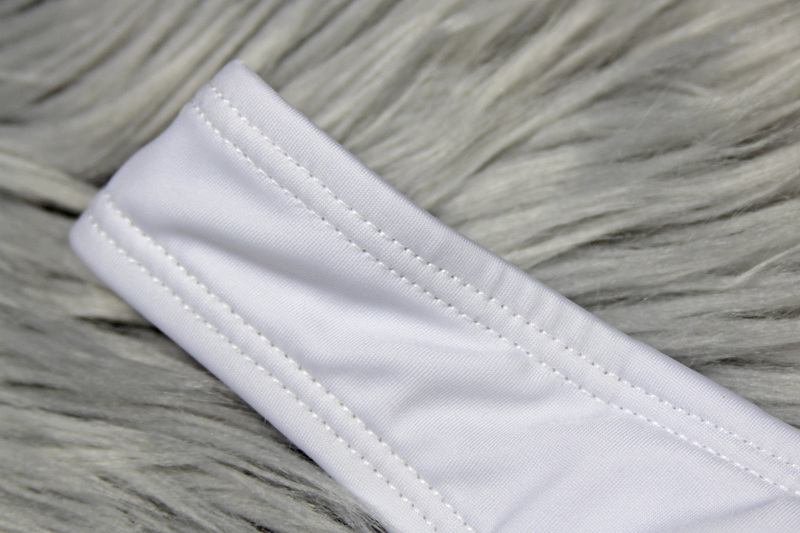 The bottom of the chest lining panel is finished with a band of white elastic, with a soft outward facing surface. The elastic band pulls the lining towards your chest, which helps keep the cup inserts where they should be. The bra cups are removable, by pulling them through the small gap at the top of the chest lining panel. This gap is quite small, so the cups can’t accidentally come out, so it is a little tricky to get them out. Personally I will be leaving these in, but I like that there is the option to remove them if you prefer, or be able to replace them with different ones of your own. The garment tag is sewn into the inner left side seam, just above the elastic band under the chest. 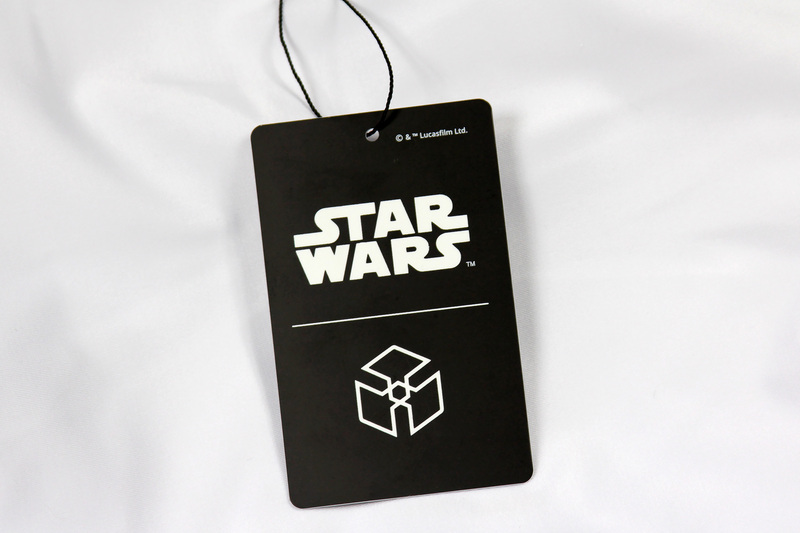 The tag is actually comprised of three black fabric tag loops – the first tag features the Star Wars Logo, Musterbrand logo, garment size, and country of manufacture (China), the second tag features garment care instructions and fabric composition, while the third tag features the Musterbrand website and company information. Obviously these tags are required, especially in a licensed item, but they are a little large – you can cut them out if you prefer. Even those these tags are black, they don’t show through the layers of white fabric, so you don’t need to remove them for fear of them showing through/distracting from the white design. This swimsuit is a size small – here are my approximate measurements (flat, unstretched) – please note the fabric is quite stretchy, and of course swimwear is designed to be worn tightly and securely. 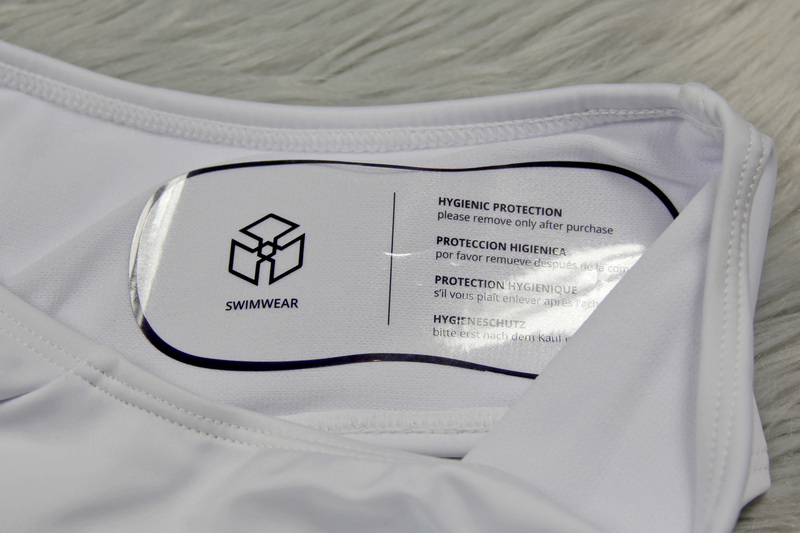 As this is a garment worn against the body, the swimwear comes with a hygienic protection sticker in the crotch. This clear sticker features the Musterbrand logo, and a note about removal in four different languages. This sticker is easy to remove, and doesn’t damage the lining fabric (unlike some garment stickers I have come across! Arg..). The swimsuit has a double row of white stitching around every edge. Swimsuits get stretched a lot while getting them on and off, so sturdy stitching helps keep the shape longer (no one wants a ‘baggy underwear’ look). The inside seams are all overlocked (serged) in white thread, keeping all the layers of fabric and lining neat and tidy at the edges. I really appreciate that Musterbrand makes Star Wars swimwear for women – as New Zealand is made of islands, spending summer at the beach is a huge part of our culture. In our interview with Musterbrand CEO Knut Bergel, he talked about wanting to be able to offer apparel options to suit year-round, which is great. Musterbrand now has five women’s Star Wars swimsuits available, in both one-piece and bikini styles – check our earlier review of the Death Star Battle bikini. I love being able to show off my love of Star Wars with my wardrobe everywhere and everyday – even when swimming! It is spring here now, and we are already getting some lovely sunny days – I can’t wait to hit the beach in this fabulous Leia swimsuit!